I would have written The Quiet War and Gardens of the Sun if Cassini had never been launched, or if it had failed, somehow, on its long journey. After all, Saturn had been already visited by four spacecraft. There were images of the surfaces of its major moons, where much of the two novels take place. There were maps. We already knew, before Cassini arrived at Saturn, something of the history and composition of those moons; could guess what it might be like to stand on the surface of Dione, or Mimas, or Iapetus. But while the previous visitors had snatched glimpses of the planet and its rings and moons as they shot through the Saturn system on their way to other places, Cassini went into orbit. Settled in. Made the place its home for thirteen years, guided by its flight engineers in intricate loops that took it close to all the major moons, eking out its fuel by gravity assists during close encounters with Saturn and its biggest moon, Titan. Cassini's discoveries and beautiful images of the planet, its rings and above all its moons, immeasurable inspired, enriched and deepened my writing. We make up worlds all the time in science fiction. But here were real worlds as weird as any ever conjured by imagination; real landscapes. Some of those landscapes were - startlingly - like those of our own planet; others were utterly different. Places where people might settle one day - but who would choose to live there, and why? How would it shape and change them? I wrote those two novels to find some answers to those questions, and Cassini helped to bring those wildly strange and various worlds into sharp focus. Launched in 1997, it arrived at Saturn, one and a half billion kilometres from Sun, in September 2004, its transit time shortened by slingshots around Venus, Earth, and Jupiter. A few months later, the European Space Agency's Huygens probe detached from Cassini and in January 2005 landed on Titan. The first landing on the moon of a planet other than Earth; the most distant landing ever made. 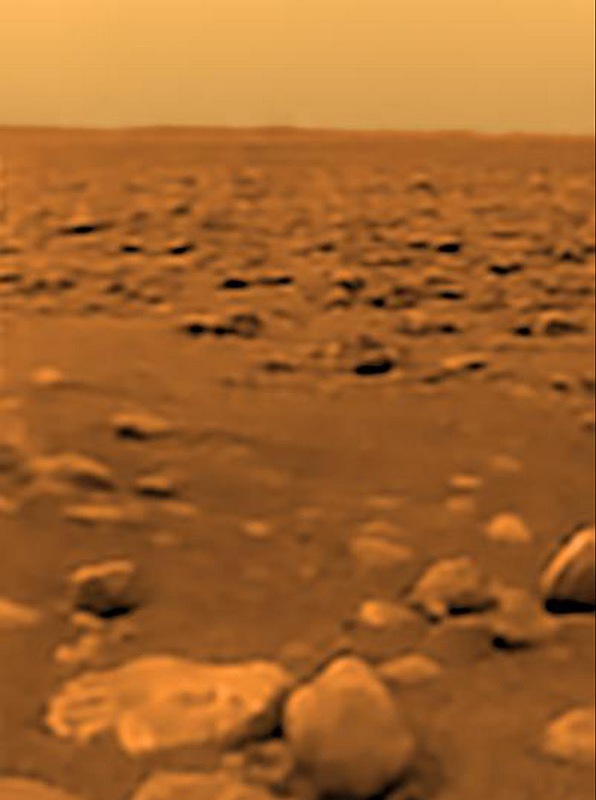 And for the first time we saw the surface of Titan: glimpses of mountains cut by branching riverine channels as the probe descended through the thick nitrogen atmosphere and a haze of hydrocarbon smog; a fixed view of the marshy surface, strewn with pebbles, of the shoreline where it touched down. Titan is the second largest moon in the Solar System. Fifty per cent larger than Earth's Moon; bigger than the smallest planet, Mercury. And because it is so cold out there, where the amount of sunlight is one eightieth of that received by Earth, Titan has retained a thick, opaque atmosphere, and, like Earth, has a hydrological cycle, and weather, and seasonal changes which Cassini has observed for almost half a Saturnian year. Its surface features, with lakes and rivers and huge equatorial dunes, resemble those of Earth, but the lakes and rivers are of liquid methane and ethane, and the dunes are built of grains of frozen petroleum. A chilly but geologically active world that's familiar yet utterly alien. Mapping and observing Titan's surface was just one of Cassini's achievements. It has discovered more than a dozen tiny moons and moonlets. Shown that the ring system is active and dynamic, an intricate dance of icy particles and shepherd moons and gravity; helped to solve the mystery of why one hemisphere of the moon Iapetus is dark, and the other is ice-bright. 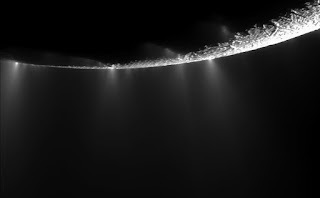 And it has not only shown that the little inner moon Enceladus is active, jetting plumes of icy dust from crevices in its south pole that access an inner sea or ocean of liquid water; it has also flown through and sampled those jets, discovering that they contain the ingredients necessary for life. 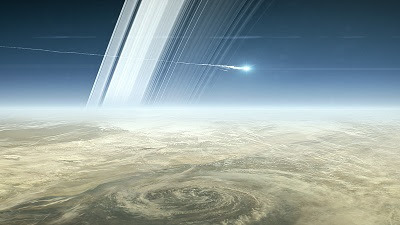 That's the reason why, as Cassini runs low on fuel, its engineers have aimed it towards Saturn. Better a fiery death in the gas giant's atmosphere than ending up in an orbit that might one day intersect with Enceledus and possibly contaminate that inner sea, and any exolife that might exist, with hardy terrestrial bacteria. And so, from April, in what Cassini's engineers and scientists have dubbed the grand finale, the spacecraft has been racing close above the ring plane, zooming through ring gaps, skimming above Saturn's cloudscapes. Engaging in the kind of manoeuvres that until now were too risky to contemplate. Thrilling moves that mirror those of its science-fictional counterparts. And now, after hooking around Titan for the last time, the spacecraft is heading inwards. Heading towards its final, fatal encounter with Saturn, on Friday. It will go out transmitting a live feed. Doing science until it breaks apart, the sharp end of a great human enterprise of enquiry and discovery. Mourn the machine, but celebrate that achievement, which has accumulated data and images that will be analysed and picked over for years to come. A lasting legacy that's given sense of shape to things formerly unknown, and names and local habitation to places barely glimpsed, or never before seen. Ave atque vale!